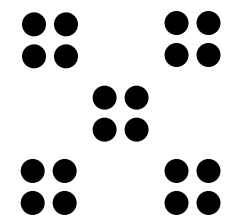 Since the 3rd graders are entering their multiplication unit, I find it the perfect time for some dot images!! 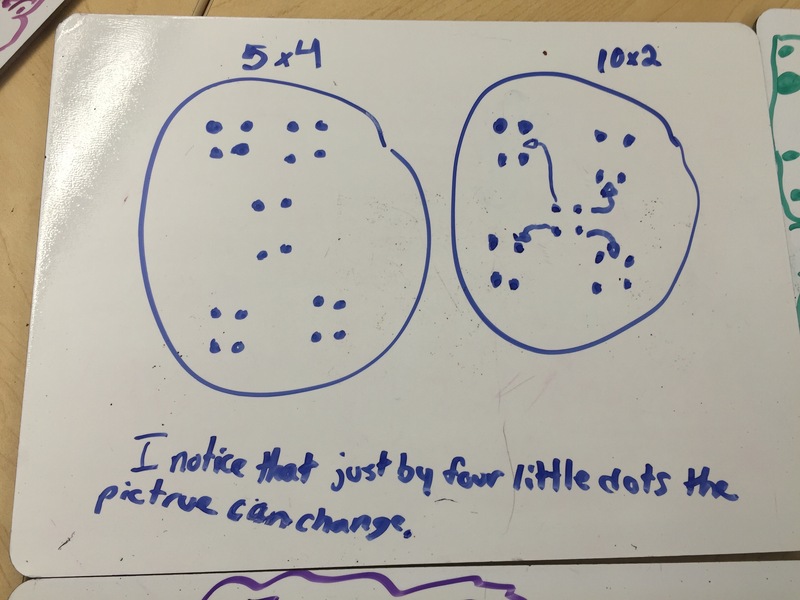 I used the image below as a quick image in which I ask them to think about how many dots they saw and how they saw them. 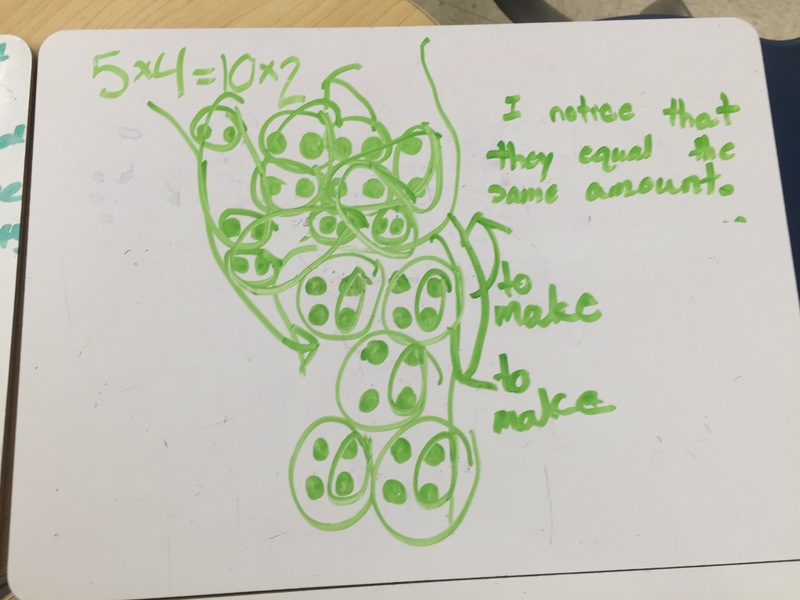 Quick images are so great for pushing students to visualize the dots and move beyond counting by ones and twos. 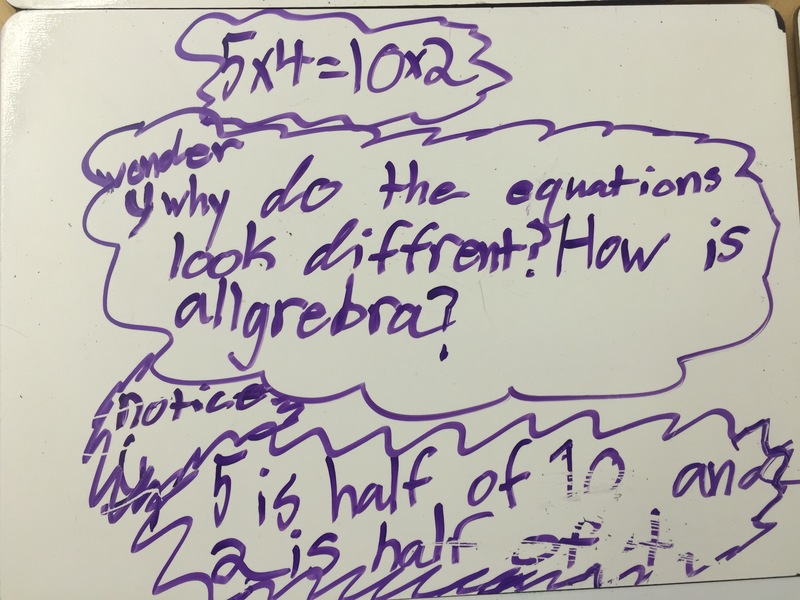 I flashed the image for about 3 seconds, gave students time to think, and then gave them one more quick look at the image to check and/or revise their thinking. Recording is something that I am always working on, making truly representative of the students’ thinking. The first thinking was adding groups of four to get 16 and then the additional middle 4 to arrive at 20. The second was skip counting, so I asked the student to do that for me and how they knew to stop at 20. He said he knew it was 5 groups of 4 so he needed to stop after 5 fours. 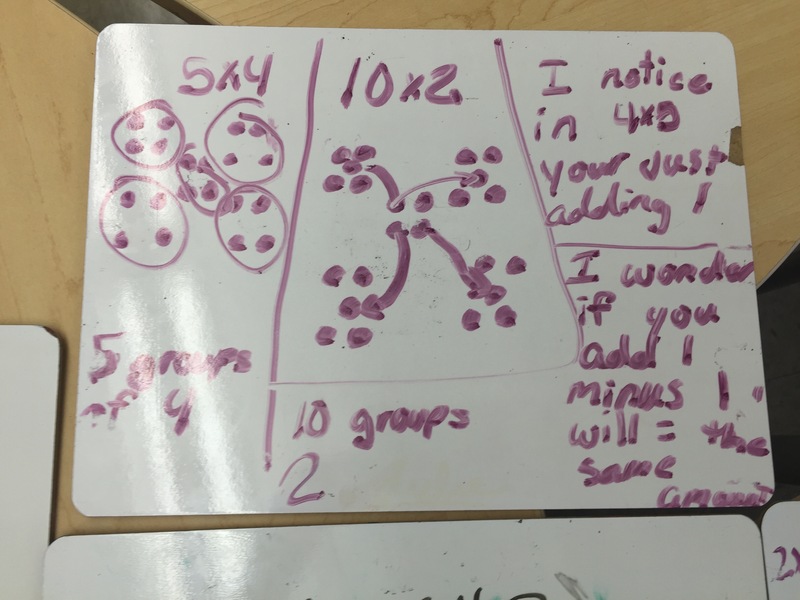 Then I wrote under that “5 groups of 4.” From there a student jumped on that and said that was the same as 5 x 4, because they were talking about that the day before in class. Then, the thing I was hoping happened, happened. A student said she did 4 x 5 because that was easier. I wrote it down and, of course, ask if that is the same thing? We began on open discussion and they agreed it was the same answer but the picture is not the same. 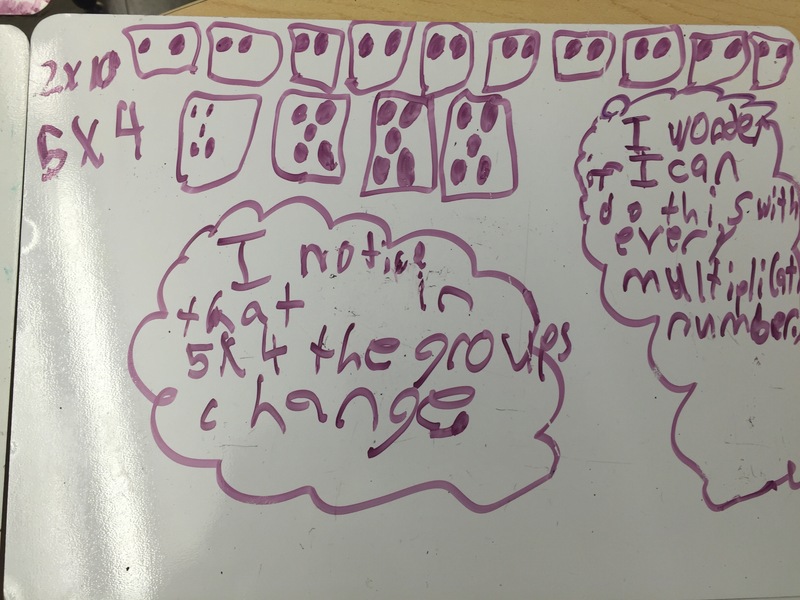 I asked how it changes and a student told me to move a dot to the middle of each of the outside fours to make fives. I drew the arrow and then one student said that is like division, 4 ÷ 4 because you are splitting that 4 between the 4 groups. I let that sit for those not ready for that yet. The last strategy was counting by twos so I had him skip count for me and recorded that. 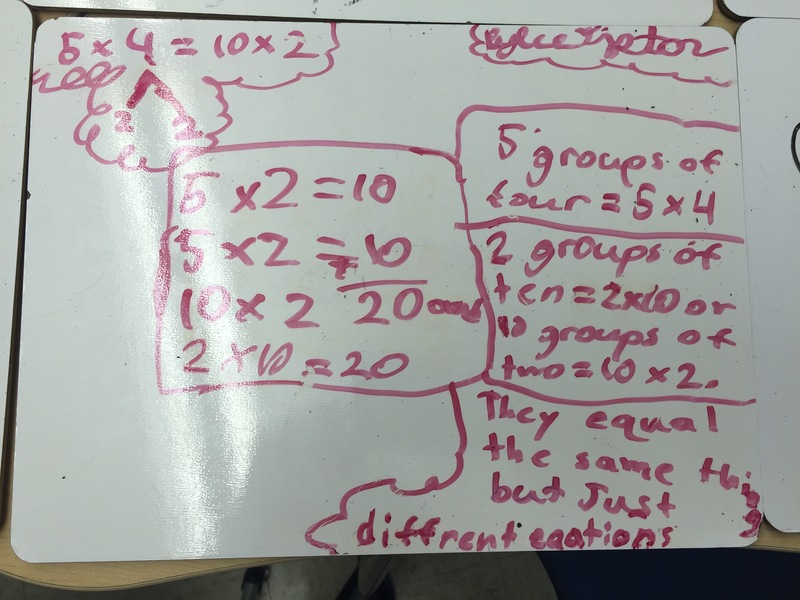 I asked if we had an equation to match that thinking and got 10 x 2. At that point, I was ready for them to do some algebraic reasoning. 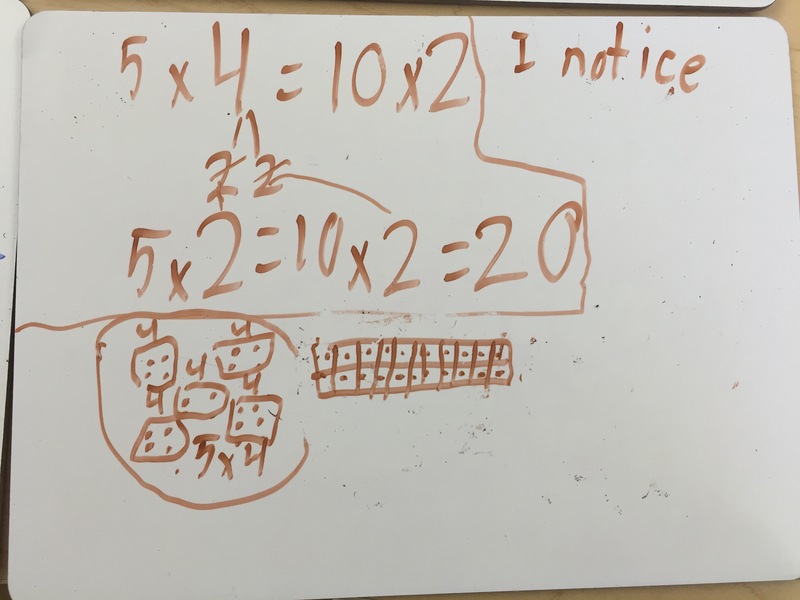 This student started with decomposing the four (I know we need to think about that equal sign later) but then moved to talking about ten frames. He said if I put two ten frames on top of one another (one attached under the other) I can see five fours (vertically). Then he said he drew them side by side and he saw 2 tens. HOLY COW! What an amazing conversation with this group! Today I posed them with a few of these noticings and wonderings and asked them to pick one and see if it always worked and why. I didn’t have time to snap pics of their journals but all I can say is 3.5 x 10 came up…so I will have to blog that this weekend! All of this K-5 work is so exciting and it is so amazing to hear and see all of the great teaching and learning going on around the building! 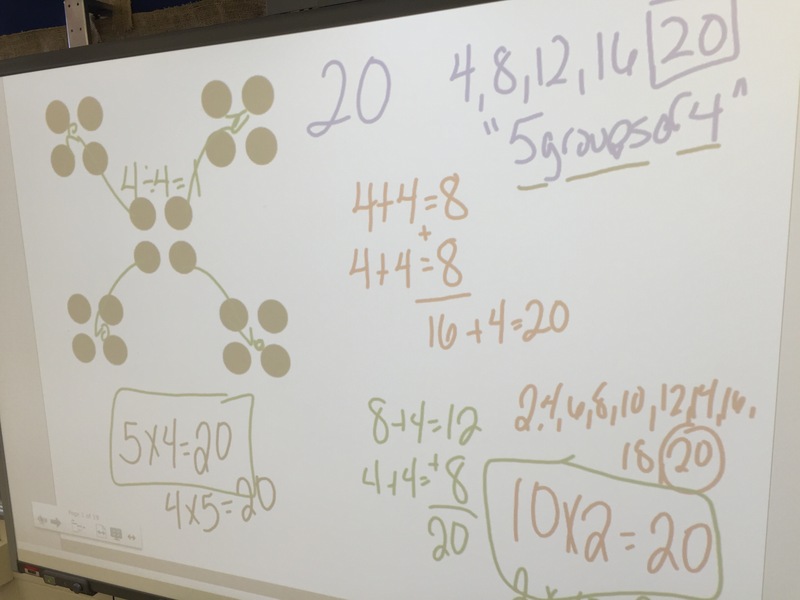 This entry was posted in 3rd Grade, Dot Images, Number Talks and tagged 3rd Grade, Number Talks on October 22, 2015 by mathmindsblog. I recognize some of the handwriting here, and was lucky enough to hear all about the 3.5×10 back in class!!! Made my day!!! Thanks so much Mike! After much conversation, we ended up going with the four groups of 8 and filming our planning, teaching and reflection with The Teaching Channel. Excited for it to be released as a follow up to this post. I love hearing about what students are currently doing and thinking about where they are heading!